“...Taking into consideration changes in the pharmaceutical industry related to state regulation and the coming legislation act, this conference brought together a large number of industry participants this year. In my opinion such conferences always provide an opportunity to draw on something new, socialize with partners, market leaders, representatives of the State Duma and the Ministry, to ask a priority question. Also it is very important to share experiences. A bright example was a teleconference with the UK. Such experience is very useful especially when one counts on innovation and improving pharmaceutical industry’s quality. Such conferences should definitely be held in order to attract as many participants as possible, namely manufacturers, distributors, pharmacy chains and medicine manufacturers. Natalia Lyabah, CFO, "Glenmark Impex"
“...For Vertex company with ambitious strategic plans obtaining relevant information about the development prospects and opportunities for the industry is extremely important. Now, during the period of major change in the pharmaceutical market, it is especially significant that such an event enables representatives of the pharmaceutical society to estimate the situation and discuss ways for further business development as well as to listen to each other. “...Thank you for the opportunity to participate in the conference Pharmaceutical business in Russia. To my mind the conference was very productive. The list of issues was extensive and relevant, especially in the current difficult economic and financial situation. 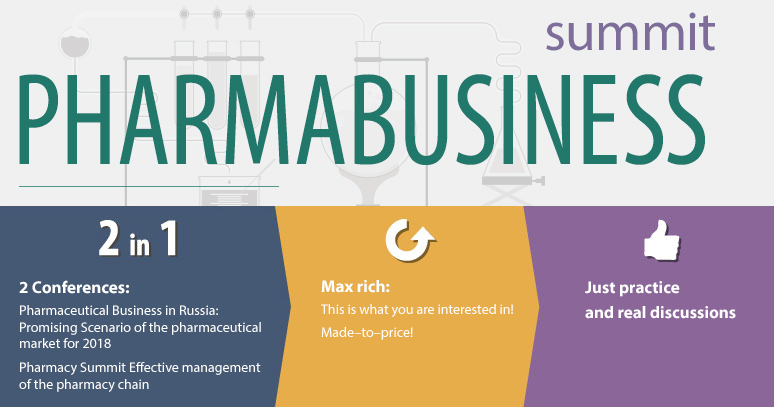 I believe that this conference could be useful not only for those who have long worked in the pharmaceutical field but particularly rather helpful for experts and managers who have changed the scope and come from other fields (for instance petrochemicals). Also, I would like to mention a good quality of provided conference materials (including a big amount of analytic materials).